In monarchies such as Canada and other realms of the Commonwealth, a coats of arms and armorial badges are emblems of honour and may only be borne by ancestral right or of a grant made to the user under due authority. Ancestral right means you must have descended from an ancestor who lawfully bore arms. In 1919 the Canadian, Australian and New Zealand governments wanted to express their sovereignty by asking the British Monarch to discontinue use of such royal honours. The Resolution requested that the British government refrain from conferring “any title of honour or titular distinction” upon any person ordinarily resident in Canada, except for those of a professional or vocational character. The Resolution declared that the Canadian government would not approve an order or decoration that carries with it a title of honour or any implication of precedence or privilege. Approval would be considered on the grounds of extraordinary service to humanity, or for conspicuous bravery in saving or attempting to save life. On the 15th day of June 2018 Joshua Shankowsky was granted Armorial Bearings, Flags and Badges of Canada as depicted on this page by under the Royal Prerogative of Her Majesty Queen Elizabeth II as exercised at that time by Julie Payette, Governor General of Canada.The Royal Warrant for such was signed in 2016 with the design and painting of the arms taking about two years to complete. The symbolism must be agreed upon by both Joshua Shankowsky and the Herald. The motto: “Fortitudo in Adversis” translates to “Strength in Adversity. The Arms: Red and gold represents Mr. Shankowsky’s heart of gold and loving compassion. The English oak represent Josh’s roots in the countries of Ukraine, Poland, Romania and Lithuania. The division line alludes to the connectedness of generations and the idea of putting together the pieces of a puzzle, a reference to the genealogical research Mr. Shankowsky has undertaken. The Crest: The phoenix, a mythical creature that rises from the ashes, represents the strength to carry forward and help carry on through adversity. The golden flames represent Josh’s involvement as a volunteer fire fighter. 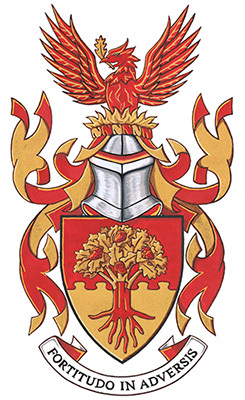 The Badge: The phoenix head refers to the crest, with flames of the sun providing a further reference to Mr. Shankowsky’s work as a fire fighter. The information is now part of the Public Register of Arms, Flags and Badges of Canada, Volume VII, page 92.